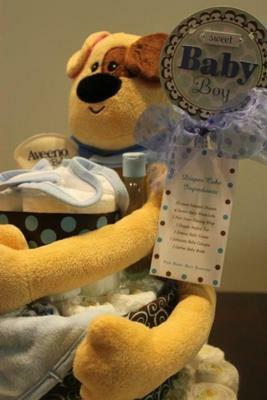 Below are several adorable diaper cakes for baby boy showers and gifts. All of them have been submitted by our talented readers! 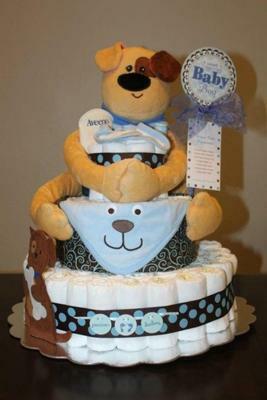 We hope these diaper cakes inspire you! Enjoy! 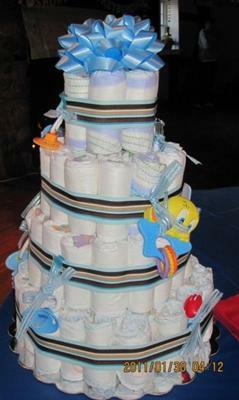 This cake was made with Huggies brand diapers rolled up in to tubes. 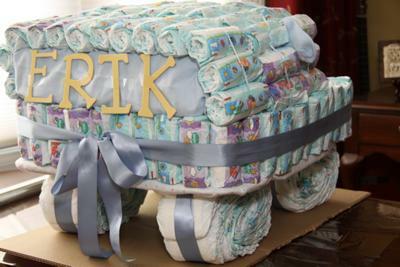 Inside the cake is Baby Lotion then I surrounded it with rolled up diapers. Then I added another ring around it. Then I added one more ring to complete the fourth layer on the cake. After finishing up the rings, I took out some of the diapers and replaced them with 8 oz bottles. This gives it more stability. The third layer has the same amount of rings of rolled up diapers. I wrapped a cotton baby blanket around the bottom two layers and secured it with safety pins (just in the blanket, not into the diapers. The second layer has baby powder as the center and then two rings of diapers around it. 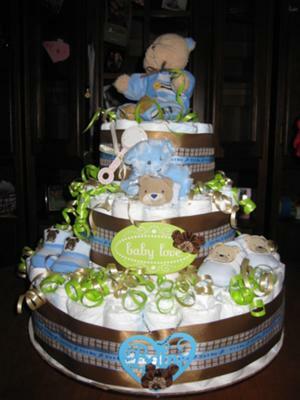 The top layer of the diaper cake is just one ring of diapers. I have onesies, socks, and a bib rolled up and "hiding" in the cake. The grosgrain ribbon is wrapped around the center of the two layers of the bottom layer and the center of the middle of the top and middle layers. I also added some tiny ribbons that I tied in bows to every other diaper. The final step was adding the toys, pacifier, and bib. The initial is hand painted and has their first name written on the wooden initial. I made this Baby Bear Cake to match the theme of the baby's room. Your cake looks great because it has lots of layers and I think a new mom would love this for her baby! Boy, your cake looks fantastic! For the deluxe style, I make sure I have my 85 diapers, cake pans to help arrange them uniformly in the fanned style. Make three tiers (40, 28, and 17 diapers) and secure them with rubber bands around the outside of each tier. I use cardboard paper towel rolls in the center for stability, then decorate according to baby shower theme or nursery theme. 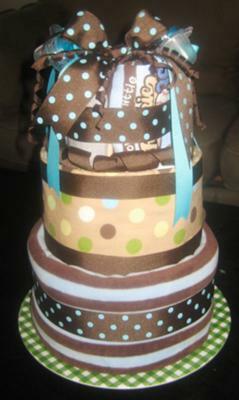 In the case of this diaper cake it was decorated for the baby shower colors of blue, green and brown. I included a Curious George stuffed animal that the customer had. 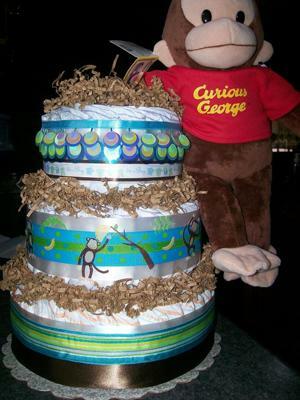 So I also incorporated some monkey embellishments to tie George in with the cake. 1ST you choose your theme. Then you roll the diapers and secure them with rubber bands. Use a different amount of diapers for each layer (tier). Getting smaller each time. Tie ribbons around each tier to secure. Now it's time to start decorating! Roll the wash clothes like you did the diapers and tie them with ribbon. Roll the mittens and slide them in the favor bag. Put the spoons and the comb and brush set in the ribbon tied around the cake layers and randomly place all of your decorations on the cake. Place the stuffed animals on top or on the side using baby diaper pins to do so. This was my first diaper cake. 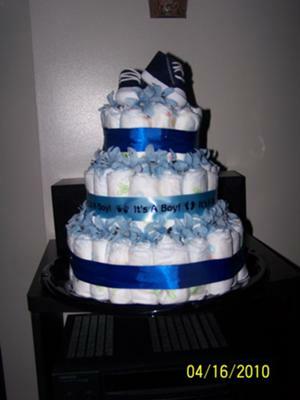 I made this"It's a Boy Diaper Cake" with size 1 Pampers Swaddlers diapers. I bought a 92 ct box but did not use all of the diapers. I will give my friend the remaining diapers along with her present so she'll have the complete box. The middle is supported with a 12 inch plastic cake dowel. Three diapers are wrapped (jelly roll style) around the top-middle-bottom sections of the dowel and secured with rubber bands. The remaining diapers are also rolled up and secured with rubber bands (each). I started by building the bottom layer first. Each row of diapers is secured with white ribbon to hold them together. 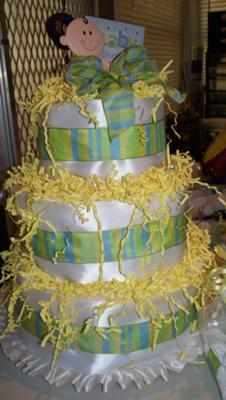 Once I constructed a 3 tiered cake, I decorated it with ribbon and used a teddy-blankie as a cake topper. I can't wait to deliver this cake! What joy it is to create a lovely memory and (work of art) for a friend. I based my cake after the topper I found at a nearby party store for about $3.00. (This store was privately owned and had everything from dresses to invitations and crafts. The topper had a traditional delicate feeling, therefore I stayed with a crisp white and blue theme. 1. I first used a tall round oatmeal container for the center of the cake. Any round tall container will work-look around your house for ideas. 2. Small diapers (with blue lining) were then rolled and held together with thick rubber bands (if you use thin ones they'll bend the diapers). 3. Diapers were then placed around the bottom of the container. 4. Ribbon (purchased at a craft store 3-4 yards around $2.00) is then measured around the perimeter of the bottom layer with a 1/2" extra. Then a strand of white pearls(purchased at a craft store 3-4 yards around $2-3) is hot glued to the ribbon. Then the final ribbon is placed around the tier and hot glued at the ends. 5. Repeat this process for the second tier. 6. If the top tier will not fit around the oatmeal container, then use something around the house ex. a can of soup. Repeat the process of the other tiers. 7. The top two Styrofoam discs (less than a dollar each, can be purchased at craft places such as Hobby Lobby,Joanne Fabrics, and Wal Mart. Repeat ribbon technique and hot glue the Styrofoam discs on top of each other. 8. Place and hot glue the lovely boy topper on the top Styrofoam disc (around $1.50 at any craft store). 9. Lastly place cake on top of doily(any craft store at around $2.00 per package)and hot glue the bottom diapers and container to it. Then decorate and glue to the cake blue and white flowers. 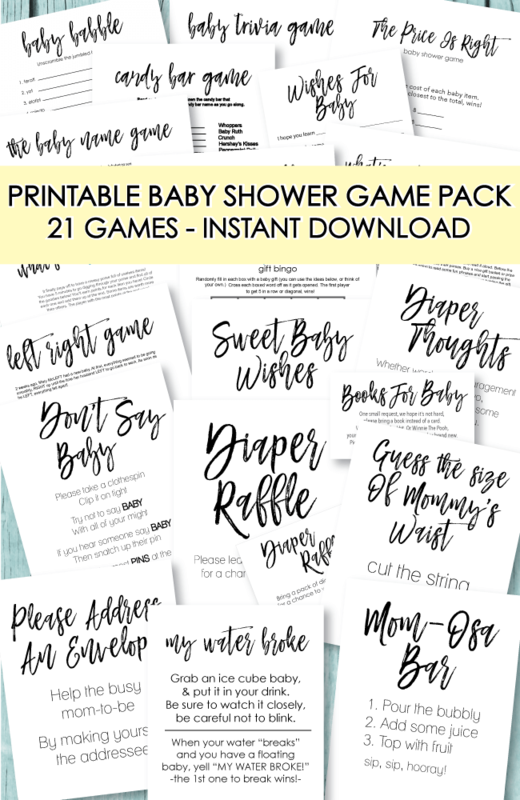 (purchased at Wal mart in the scrapbook section for less than $1.00 per package). Voila! you have an original, priceless, timeless, piece of work to give. Transporting ideas: place the cake in a round laundry basket in order to keep it from moving in your car. 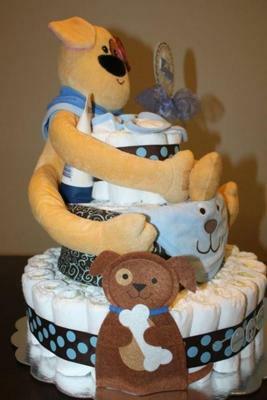 Other cake ideas: if your friend or family member has already picked out a tier cake, then surprise her with a replica of the cake and turn it into a diaper cake. I used cloth diapers, onesies, washcloths, receiving blankets, blankets and a lot of ribbon. I rolled each diaper, onesie, etc - and wrapped with rubber bands, creating 3 layers. I used small dowels to prevent the cake from tipping, then decorated with ribbons and pacifiers. I was looking for a unique and memorable gift for my boyfriend's nephew's 1st birthday and came up with this Baby Bummer! It's made up of diapers, receiving blankets, onesies and a pair of socks. Could you share instructions on how to make the hummer with diapers? Can I please have the instructions for this?! My sister is having a baby and would love to make this for her!! Thank you!! Can I please have the instructions? Can you please send me the layout or instructions on how you made this. My good friend is having a boy and her husband is being deployed before he will be born and will be gone for a year and I think this will be amazing to being to her! I would really really appreciate it, I have experience I've made a baby carriage and a 4x4 truck so I kinda have some ideas but this would be awesome! would like thr recipe... neat!!!! Please let me know how you make this. loveable.bg@gmail.com. its just what I need for my cousin. Would love to know the instructions for making one. My email address is Im4dsny@aol.com. Thanks so much! 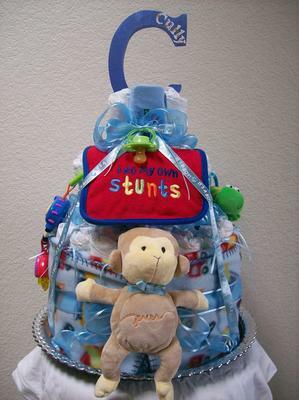 This is a twist on the original diaper cake! 1. Roll 4 separate diapers, starting with the open end and roll it to the folder corner with the diaper still folded in half. Use a rubber band to hold it in place. 2. Next stuff each rolled up diaper into the sleeves and legs of the outfit of your choice. 3. For the body roll between 6and 10 diapers around themselves until you have a nice round circle of diapers. Secure with a rubber band. 5. Place diaper circles on top of each other inside the outfit as the body! 6. Position as desired and enjoy your beautiful diaper baby! 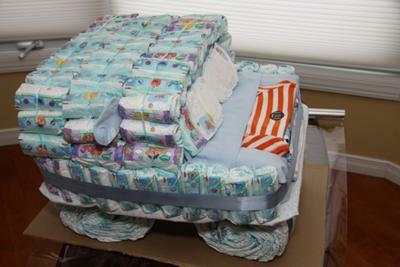 I used size 3 pampers for this Blue Car Diaper Cake. 8 for top tier a total of 19 for the middle and 40 for the bottom. I just used the colors of the car and diapers to select the ribbons and accessories to put with it. It was a lot of Fun to make and completed in less that 2 hours. 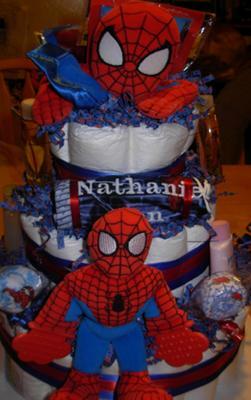 This Spider-Man themed Diaper Cake was designed using size 2 disposable diapers and is trimmed in Spidey's blue and red colors then topped off with Spider-Man straw paper as the icing. Includes 1 Spider-Man teether, 1 Spidey Security Blanket, 1 Johnson & Johnson Travel Pack, 2 Boo-boo pack, 2 Spider-Man washcloth lollipops and 1 Spider-Man bib with the child's name embroidered on it. The cake was then wrapped in tulle. 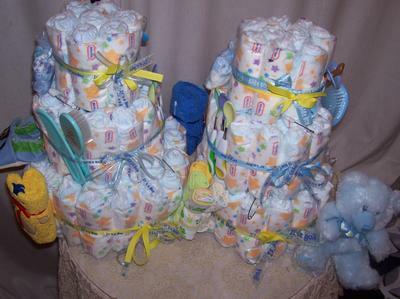 This diaper cake was so much fun to design. 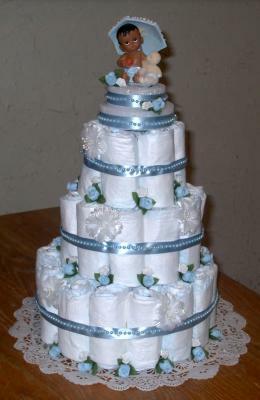 I made a 4 tiers diaper cake for a friend. I used the blue and brown ribbon, top it off with a big blue bow. I used size 2, 2 packs diaper and lots and lots of baby stuff, for example rattles, pacifiers, brush and combs, forks and spoons and some more, hope you all like it. Cake Sticks White about 8 - 10"
Roll each diaper (roll opening of diaper into the diaper) and place a small rubber band around each one. Take a large rubber band and place it around 2 rolled diapers, continue to add rolled diapers until you form a circle for the 1st layer (almost the width of the Wilton board). When you form the bottom circle take 3 cake sticks and place in the diapers for support for the next layer of diapers. Take tissue paper and rap it around the bottom layer of diapers. Cut extra tissue paper off at the corners and tuck under the layer of diapers. Make your 2nd circle of rolled diapers about a 1/2 - 1 inch smaller than the bottom layer performing the same process as stated above. Slide the 2nd layer of diapers onto the sticks. Place tissue paper around the 2nd layer as you did the 1st layer. 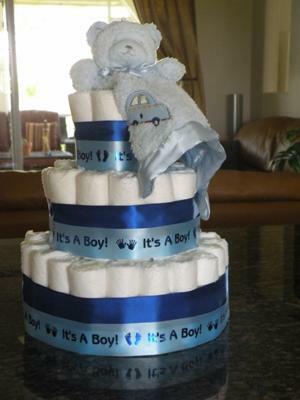 Make a 3rd level of rolled diapers and place over the sticks and place tissue paper around it. Take wide white ribbon and place around the layer of diapers covering the entire side. Since my ribbon wasn't wide enough to cover the height of the diapers, I placed 2 rows of white ribbon on each layer. You can use straight pins or a little of hot glue to hold the ribbon. Place the stripped ribbon in the center of the white ribbon around each layer of diapers. Attach the same way as you did the white ribbon. Place shredded paper on the top of each layer. 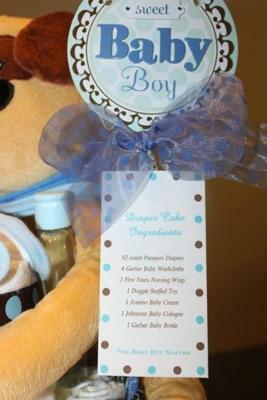 Make a bow for the top of the diaper cake. Hot glue shredded paper, bow and baby topper to the cake. Use very little glue so it doesn't stick to the diapers. I took the baby shower invitation and cut it down to a smaller size. I took green floral wire and glued it in between the invitation and then placed it into one of the diaper openings at the back of the cake. I added little pacifiers on top of the shredded paper which you can?t see very well in this picture. I made this doggie diaper cake for a doggie lover mom-to-be, my sister-in-law! This is made up of 92 pieces pampers new Swaddlers size 1 diapers individually rolled & held in place by small hair ties / rubber bands. Each tier is further held in place by larger rubber bands and wrapped and decorated by ribbons. The baby essentials are placed both inside and outside the diaper cake. A complete listing of the ingredients can be found in the pictures attached. I found making diaper cakes a stress-buster for me. This is my first diaper cake and I'm looking forward to making more. (So far I made two since i started last month). However I'm only making them as personal gifts for expectant moms who are close family and friends. This Little Red Wagon Diaper Cake was made for a cousin when she had her first baby. 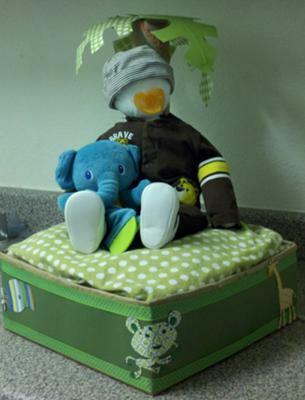 It was made with one blanket, a small basket, 2 washcloths and 20 diapers. Wrap a red baby blanket, sheet or towel around a rectangular basket. Tuck it in to the inside of the basket and fill the basket with rolled diapers, rolled baby washcloths, baby goodies such as lotions, socks, booties, hats, onesies, etc. Roll 2-3 diapers and secure with a black or gray washcloth to make each wagon wheel. For the wagon handle, wrap a used wrapping paper roll in black wrapping paper or wrap with black ribbon. Make the top handle out of tin foil and wrap black ribbon around it. Secure with a glue gun. So cute! You can also place a big furry stuffed animal on top if you wish! Everything used to make this cute creation (minus the handle) can be used by the new mom! Roll each diaper and secure with rubber bands. We are going to make 2 tiers. I made a 6x9 inch square bottom and covered it with Spongebob wrapping paper. I used 2 cardboard cake bottoms for the cake to sit on, glued and taped them together, placed wrapped bottom onto the cake bottoms and hot glued in place. Then I glued yellow ribbon around edges of bottom wrapping. Made a 4x4 square out of rolled diapers, secured in place with a large rubber band and hot glued in middle of bottom. Next I glued yellow ribbon round middle of top,also name in place. 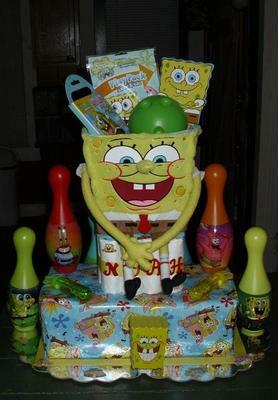 I glued plastic bowling pins in place and green and yellow bubble sticks on each side,glued Spongebob night lite in center of wrapping. Top with a Spongebob basket filled with treats and place few stickers in place! My Grandson loved it!!!! 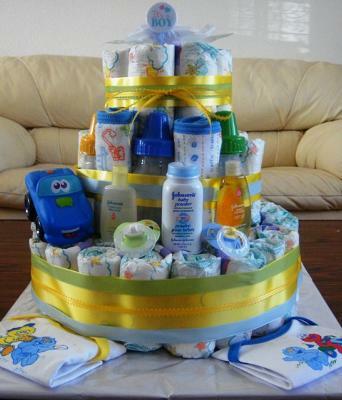 I love this idea for a toddler diaper cake! My grandson loves Spongebob and I wasn't really sure what to get him for his birthday. He already has a ton of Spongebob toys, stuffed animals, games, etc. So I didn't want to get him something he already had. This gave me the idea to create a Spongebob present that is made of Little Swimmers diapers for when you go swimming, a beach pail, bath and pool toys, bubbles, a beach towel, sunscreen, sunglasses, a coloring book, flip flops, temporary tattoos, stickers, markers, paints, sand toys, inflatable pool toys, goggles, snacks such as Spongebob crackers and fruit snacks. His birthday is in June so I went with a summer theme!